Recently the Loretto Chapel was entered into the Atlas. The Santa Fe chapel is known for a very cool looking set of spiral stairs built in 1877 by a mysterious stranger. With no central support the stairs are said by the sisters of Loretto Chapel to be miraculous in construction. While there are those who beg to differ about the miraculousness of the stairs, no can deny that the stairs look, well, really cool! So without further ado, the Atlas Obscura presents to you the most intriguing, fantastical, dizzying spiral staircases from around the world. First the Vatican Museums! The Vatican Museums spiral staircase is one of the most photographed in the world, and certainty one of the most beautiful. Designed by Giuseppe Momo in 1932, the broad steps are somewhere between a ramp and a staircase. As you may be able to see more clearly here, the stairs are actually two separate helixes, one leading up and the other leading down, that twist together in a double helix formation. Little did the Vatican Museum know in 1932 that this formation would come to represent life itself, with the discovery of the double helical DNA strand. Many more spiral staircases on the way… just try not to get dizzy. Another set of very famous spiral stairs are the “Tulip Stairs” in the Queen’s House, in Greenwich, England. These, like the Lorretto Chapel stairs, have no central support, but here they are supported by being cantilevered from the walls, with each step resting on the one below it. Built in 1635 and looking distinctly eye-like, these were the first geometric, self-supporting spiral stairs in Britain. Though known as the “Tulip Stairs,” they would be better called the fleurs-de-lis stairs, as that is the symbol repeated (and oft mistaken for a tulip) in the wrought-iron balustrade the runs up the stairs. It is the symbol of the French-born Queen Henrietta Maria’s Bourbon family. Of course, the stairs have more to them then just their beauty and history. They also have a famous ghost. In 1966, a Reverend visiting the Queen’s House took this picture, and when he developed it, saw the shrouded image above. Kodak examined the film and said it had not been tampered with, and the Reverend and his wife swore that no one was on the off-limits stairs when they took the picture. It is unclear who the ghost might be, though apparently in the 1600s a maid fell (or jumped) to her death from the stairs, making her a likely candidate to claim the honor. Looking ridiculously like a haunted house from Scooby Doo, is the Baron’s Palace, in Heliopolis, Egypt. 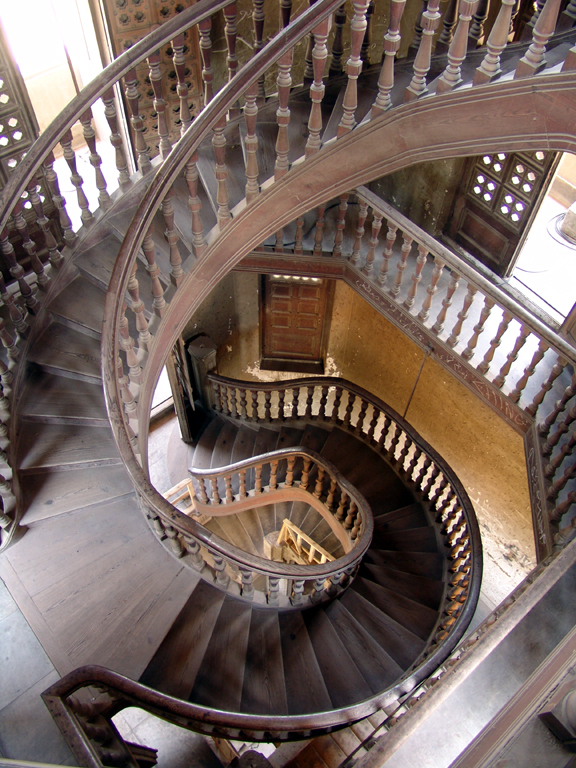 Within this magnificent house, built for the Belgian industrialist Baron Empain, is a set of beautiful wooden spiral stairs that weave through its center. One of the best myths about the house — along with the usual fare of devil worshipers, ghosts, and secret tunnels — is that the entire structure was built on a rotating base, which allowed the Baron to sit in the center and turn the house to suit his needs. Empain was a fantastic engineer, so I still hold out hope that this is true. This next site is close to my heart, being both a location of fantastic spiral stairs, an octagon house, and located in Wisconsin, near where my grandparents once lived. This 1854 octagonal house is made all the more amazing, by its dizzying spiral staircase. Octagon houses have an amazing history and connection to Phrenology, utopian settlers, Victorian health reform, and all sorts of other cool stuff. Because octagons and spiral stairs go together like white and rice, here is yet another, newer, but still amazing looking spiral staircase in an octagon, this time on Roosevelt Island in New York. Another building with a great history, this particular octagon was built in 1841, and was once an insane asylum, before being abandoned, and eventually renovated. Today, after a thorough renovation, the building serves as a community center and the stairs, while perhaps a little “new” for my antiquarian tastes, are still really quite amazing looking. Partially because I am lazy, and partially because I want to share many more awesome spiral stairs before boring you to death, from here on out the words will be less, and only one or two pictures per staircase. In other words: Sit back and enjoy the flights! Hope you enjoyed this very incomplete collection of some of the worlds greatest spiral staircases, and if you are anything like me, you are dizzy and need to go lie down for a second.